Christmas Eve. Do I go fishing in the mud and the heavy rain or do I join the crazed masses worshipping the gods of commercialism and excess in their glittery temples otherwise known as shops, malls and supermarkets? Well, although I placed a question mark at the end of that in effect it’s more rhetorical than decision making. With the alarm set for an early start I was at the lake for first light. Although we’ve now passed the shortest day of the year, it will still be some time before we begin to see significant change. In the meantime when fishing day-only sessions, and particularly if there’s a reasonable distance involved, I maximise time by spending as much of it as I can on the bank. Before I even cast the deadbaits out, I spotted an otter swimming across the lake. It’s the first time I’ve seen one here and just from my own sightings, there’s no doubt that they are on the increase and their range is extending. And of course that creates an area of conflict with angling in general. I watched the recent SpringWatch otter special with particular interest as I knew they were going to cover angling-related issues. There was a concession that otters are a problem but the answer to that was pretty much to erect otter-proof fences. But the cost is enormous and what about the numerous rented venues? Not everywhere is a small privately owned commercial (and that’s assuming the owner is wealthy and wants to spend his cash on fences! ), but even if the club had the money I can’t see many landowners wanting fences put up. They’re not aesthetically pleasing. And what about rivers and canals? You can’t fence off thousands of miles of waterways. I’m not trying to sound anti-otter, just recognising that there are issues. In fact as both a keen naturalist and angler I can see the big picture and both sides of the argument. Plus I consider myself to be fairly reasonable and balanced. Some of the outbursts of rage you read don’t do angling any favours at all. Diplomacy is important and we need to realise that we are all ambassadors for angling. Our words have the ability to either win over or alienate the general public. Choose them wisely! Anyway, after the sighting of the otter I cast out, settled back under my umbrella and poured a cup of tea. It wasn’t long before the sardine was picked up by a fish. Unfortunately though I never got to the striking stage as the pike dropped its potential meal. But 30 minutes later the roach proved to be too much of a temptation and the float totally disappeared. The result can be seen in the photograph above. The venue is basically a small fish one and it’s been some years since I even had a double from there. The big pike appear to have totally disappeared. And no, it’s not the otters this time! The water temperature was 6.3C which was exactly 2C up from my last visit six days previously. There are numerous factors that affect our angling and one of the main ones, certainly during the winter, is water temperature. I have recently started sharing my readings on both my facebook page and my twitter account. So if you want to keep up to date with that information then make sure you ‘like’ or ‘follow’ – or both of course, depending on your own social networking position. And if you are on twitter why not use the #watertemps hashtag? You don’t need to give out specific details, general stuff is fine. It’s all about being a helpful resource to your fellow angler. UK anglers: Why not use #watertemps hashtag and share with your fellow piscators? Don't need to give specific locations just general stuff. As well as the otter, on a less controversial front, I had a pair of very active kingfishers in the general area where I was fishing. And the bank-side common alders were feeding magnets for a flock of c40 siskins. They were undisturbed by my presence so I managed to get a silhouette shot of them against the grey sky. The fishing was definitely on the slow side but a couple of hours before dark I netted my second pike of the session, this one being tempted by a bleak deadbait. I knew that roach session I had on the Severn last summer, where I was plagued by bleak, was not in vain! With a fishing-free day on the 25th I was back out on Boxing Day. With Wolves at home to Peterborough in the afternoon I only had the morning so decided to hit the local canal. The water temperatures were continuing to rise and at first light the reading was 7.1C. Never mind pike, with the actual reading plus the upward trend, we’re now into barbel territory. 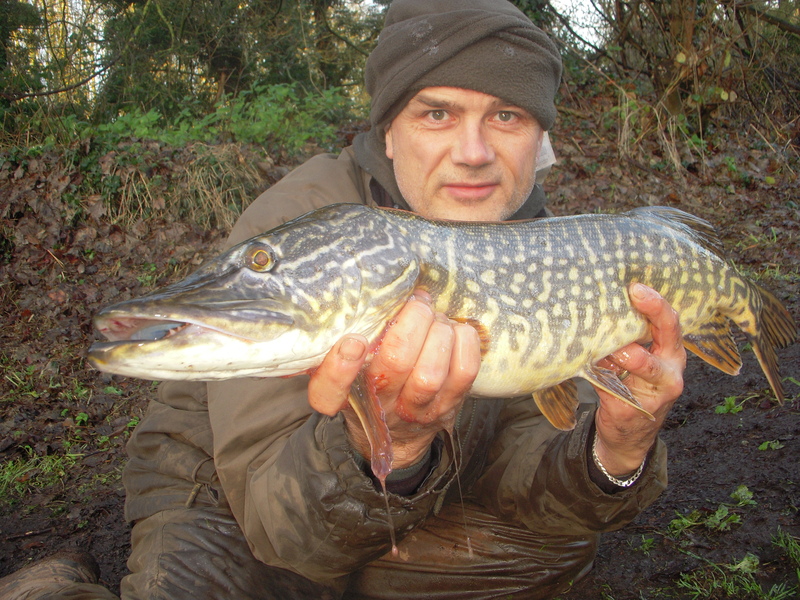 But for now I’ve got my pike-head on and so I was more than happy to cast out a bleak and a sardine. An hour into the session and it was the saltwater fish that had tempted a pike. Not much of a fight, a minute or so later the unhooking mat was occupied as it has been on every outing I’ve made over the last couple of weeks. The top hook came out easily enough but the other needed a little bit of work with the forceps. No damage to the pike though, but again I can’t stress enough the importance of not leaving the strike too late. It’s better to pull out and lose the fish than it is to have one deep-hooked – and even more so if you’re a novice and you don’t know what to do. Anyway the only hurt to this fish was its pride. Like so many of its fellows do it went back sulking. They lie there in the margins for a moment or two, then with a powerful flick of the tail they shoot back into the deeps. The pike itself was not only an achievement because of the venue, which doesn’t yield large numbers of fish, but also it was a decent size based on that. That’s another point I’m always emphasising – all fish weights are relative to the venue. An hour later and the float above the bottom-fished bleak began to tremble and move. Unfortunately though the initial excitement didn’t develop into a strike. With no teeth marks on the fish it could well have been a perch that picked it up, felt the resistance, and then dropped it. I’ll never know!